METTLER TOLEDO’s range of benchtop and portable digital density meters measure density, specific gravity (SG), alcohol concentration, BRIX, API degrees, Baumé and Plato with high precision and within a short measuring time. Benchtop density meters have a built-in Peltier thermostat to accurately control the temperature so a water bath is not required. 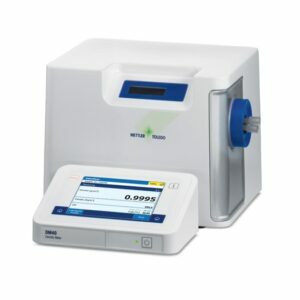 They can be connected to a refractometer, spectrophotometer, pH meter, titrator or other instruments to measure several parameters simultaneously. Various automation units are available to further improve productivity. METTLER TOLEDO’s range of benchtop and portable digital refractometers measure refractive index and related values, such as, Brix, invert sugar, HFCS42 or HFCS55 or other concentrations. Portable refractometers provide automatic temperature compensation. They can be used in the lab or in the field, for instance for measuring Brix, Oechsle or the freezing point of ethylene glycol and propylene glycol/water mixtures. Benchtop refractometers have a built-in Peltier thermostat to accurately control the temperature so a water bath is not required. They can be connected to a density meter, spectrophotometer, pH meter, titrator other instruments to measure several parameters simultaneously. Various automation units are available to further improve productivity.